Eurasian patent is for the plant designed for the organic raw materials pyrolysis processing. 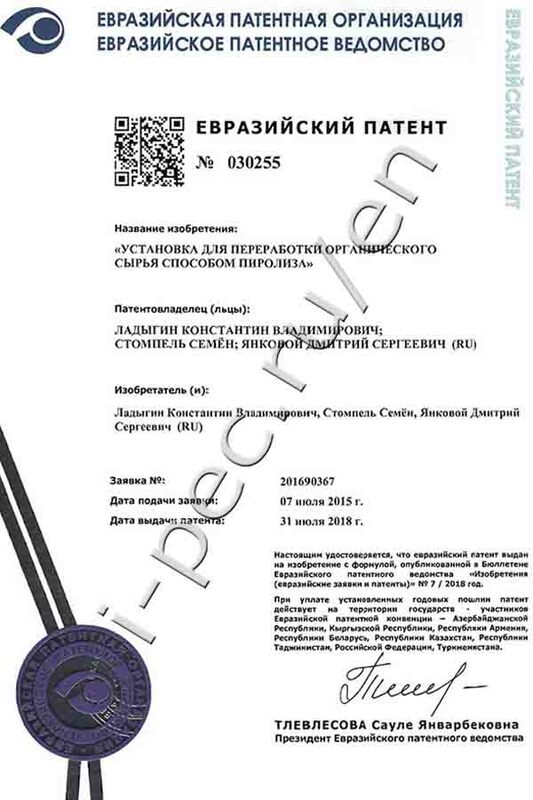 The patent is valid on the territory of the States Parties of the Eurasian Patent Convention – Azerbaijan, Kyrgyzstan, Armenia, the Republic of Belarus, Kazakhstan, Tajikistan, Turkmenistan and the Russian Federation. The equipment and technology of pyrolysis unit TDP and the technical result of the process became patented. The plant for processing of organic raw materials by the pyrolysis technology is capable of processing solid and liquid raw materials in any combination with irregular moisture content. The increased safety of operation and extended service life of the plant before overhaul is ensured. Depending on the incoming raw materials for processing, it is possible to determine in advance the chemical and fractional composition of the liquid pyrolysis fuel and ash residue. The technology of organic waste pyrolysis at the Thermal Decomposition Plant has no competitive analogues in the above-listed countries. None of the other existing technologies meets the environmental requirements and provides the output of conditioned pyrolysis products. 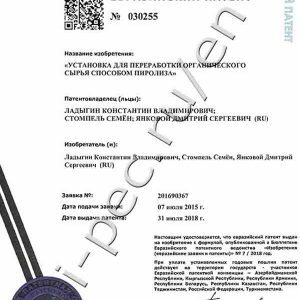 TDP pyrolysis plants are widely demanded in the market of the CIS countries, obtaining a patent will provide the reliable legal protection for IPEC exporting equipment abroad.